Most High HOEPs occur in the upper right quadrant because wind shortfalls and demand under-forecasts result in both tighter than expected supply conditions and higher than expected demand, creating upward pressure on the real-time price. The forecasting errors in the top left and bottom right quadrants have off-setting price impacts (with one error putting upward pressure on price and the other putting downward pressure on price). In the bottom left quadrant, both forecasting errors put downward pressure on price; there is more wind generation relative to forecast and less demand than forecast. Wind shortfalls and demand under-forecasting are not the only causes of High HOEPs. Other events which force the market to turn to flexible (and typically more expensive) resources to supply demand in real-time also put upward pressure on prices. However, as shown in Figure 2- 3, 75% of the High HOEPs in the Current Reporting Period occurred when there was both an under-forecast of demand and a wind shortfall. wind generators therefore have no reason to try and meet forecast supply - which a cynical person would phrase as wind (and solar) generators have no incentive to provide a product of any value to end users. Coal has a dispatchable range of 20 to 100 percent full power compared to around 70 to 100 percent for combined cycle gas...For gas to provide the same dispatchable power as coal, with both operating at their respective minimum loading points, several times as much gas generation would have to be on line meaning very much more GHG emissions. Under these circumstances coal, rather than gas, would make a better partner for wind. A long-term view of the incidence of high price hours shows the spike occurring as coal was eliminated. 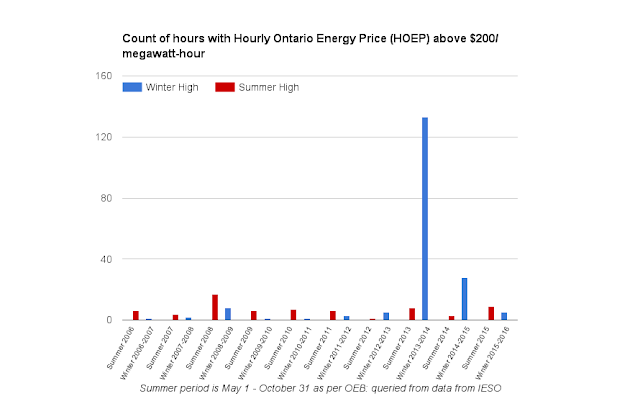 It does coincide with colder winters too, but the OEB data indicates that was not the cause during winter 2015, which is the second highest incidence of high priced hours in the past 10 years. The most recent winter had far fewer high priced hours, but it also had huge curtailment of wind. 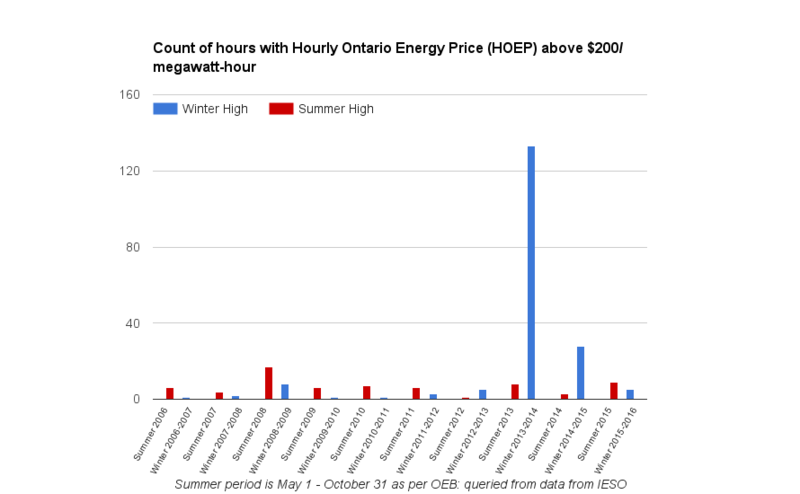 Recalling the IESO averaged a significant "Demand Overcast" in the MSP's report, it's credible to conclude the over demand overestimate is deliberate, acting to protect against unreliable wind forecasts - with the operation of the grid therefore requiring the increased curtailments seen this past winter. While the high priced hours dropped this past winter, negatively priced hour continues what has been a relatively consistent upward climb in recent years - a climb coinciding with the growth of wind and solar generators. 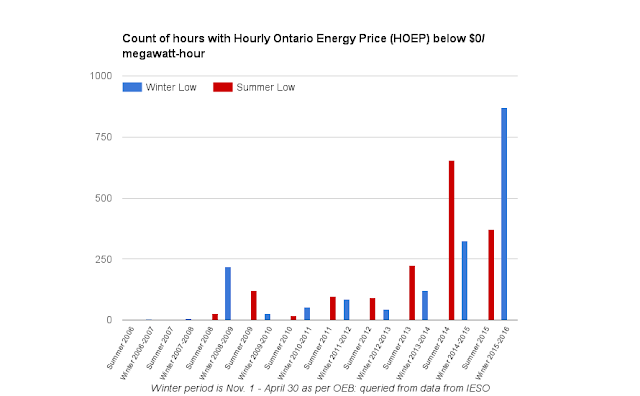 The Hourly Ontario Energy Price (HOEP) was negative 1 in 5 hours from November 1, 2015 to April 30, 2016. 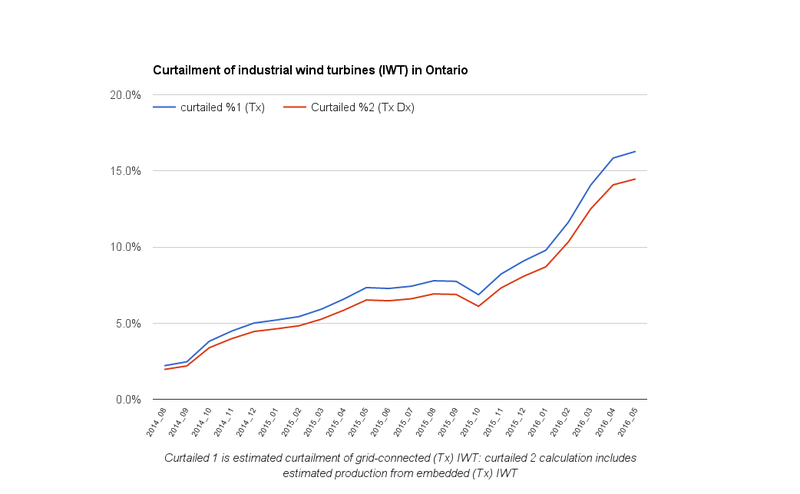 I noted on Twitter my estimates show Ontario now curtailing a higher percentage of wind than the numbers shown for China - and perhaps more than any other jurisdiction. 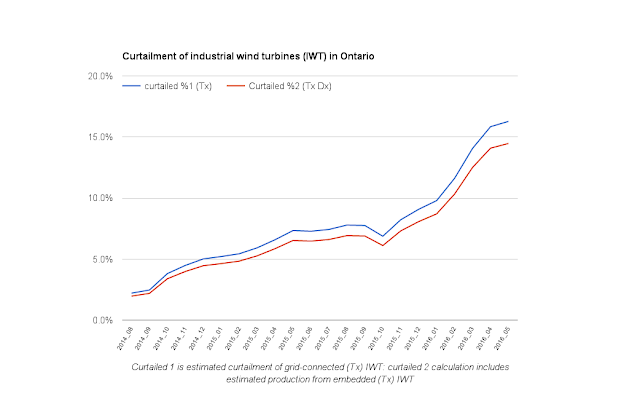 spreadsheet with Ontario Wind curtailment graphic.